Targets visible signs of ageing. This ultra-light exfoliant improves visible signs of ageing and refines pores for radiant, youthful-looking skin. Formulated with 2% BHA (salicylic acid), this leave-on treatment smooths the skin’s surface while an advanced antioxidant and peptide blend defends against environmental stressors. Apply once or twice daily after cleansing and toning. Lightly soak a cotton pad and apply over the entire face, including the eye area (avoid the lower lash line and eyelids). Do not rinse. For daytime, follow with a moisturiser that contains a broad-spectrum sunscreen rated SPF 30 or greater. Allergic to aspirin (acetylsalicylate)? Do not use this product as it contains salicylic acid (BHA). I’m going into my 30s, and I still have clogged pores on my forehead. Yet, the BHA 2% liquid—my ultimate favorite from PC—keeps my acne under control, I wanted something more sophisticated. I tried this product and I love it: it gently unclogs my pores, while preventing early signs of aging. Loaded with peptides and hyaluronic acid, I think it can act as a toner AND an exfoliant if you’re constantly in a hurry (as I always am). Last thing: this exfoliant has a very pleasant, flowery smell. I really like it! i bought a trial size 30ml and I used it once a day at night before going to bed and kept it on till next morning and i did not use it in combination with any other product or moisturizer, only washed my face then applied it with cotton pad as instructions, for the first two days it seemed to be working and the skin look and texture seemed to be improving, however, this did not last, by the third application the skin returned to normal, and then started getting worse with bumps, breakouts, and spots everywhere on my face, which was really really disappointing, I believe I have a combination skin and this product did not improve the texture, look, brightness or resurfacing of my skin. Customer Care: We are sorry to hear of your experience. Unfortunately, not everyone reacts in the same way to skin-care ingredients. We will contact you by e-mail for further advice. Around January I made the skin-investment i should have done years ago, I ordered a completely new skin-regimen from PC and immediately noticed how my skin improved. I have combo skin: oily t-zone (blackheads) with normal cheeks (but huge pores) and dry patches around mouth and sometimes eyes. With this product I noticed that my skin became very smooth, the smoothest it has ever been and even my bf noticed the difference. I also saw how my blackheads appeared less black, which I appreciated greatly since it's one of my main skin concerns. I've been out of it for the last month but it lasted me about 4 month. Despite loving the results I won't be repurchasing it since the liquid form felt like such a waste when the cotton pad got more of the product than my skin. Instead I'm going to try the BHA gel and hope to see the same results. I have been using it for 7 months now but have yet to see a difference. My cheeks are quite dry and this products stings a bit on the dry spots. Iman - Absolute favourite product! The best product I have ever bought! It is an amazing exfoliater, but do not underestimate the fact that your skin has to get used to it, since it will leave your skin dry if you use it too often in the beginning. But it is amazing! Thank you! Maria - best of all BHA, but maybe causes breakouts? I've ordered this one after trying out all other paula's choice's BHA's.I loved this BHA product more than others. 2 % BHA liquid causes dry and peeling skin, gel formulation is difficult to spread and lotion wasn't potent enough. Having said that the lotion did make my skin a tiny bit clearer and didnt cause any side effects. This treatment might have caused additional breakouts for me(having used for 2 weeks now). I like the consistency and how it's not drying, anti-aging formula is also a huge plus. I will continue using this for a week or two and if breakouts won't lessen, I will go back to the lotion formula. I have been using Paulas for some time now, and it has transformed my skin, from dull skin with breakouts, into an almost perfect skin! And in this product, I finally found the perfect BHA exfoliant for me! The BHA 2% gel formula, left my skin a bit sticky and greasy, and the result was not as good as I hoped. So I tried this product......the result was AMAZING!!! Pores looks and feels smaller, less breakouts, and no more dull skin for me! Finally I found the perfect BHA exfoliant for me! I was expecting clean and diminished pores and decongested skin. It's been almost two weeks of daily use of this product, twice a day. My pores are still clogged, no change whatsoever on the size. I'm pairing it with a PC cleanser instead of my Liz Earle one that I loved of much but seemed, according to PC, not the best option for my combination to oily and clogged pores skin. I still have to use a cloth to try and get as much debris as possible from my pores, even with the new choice of cleanser. I had so high hopes on this product given some of the reviews. I'm quite disappointed it didn't work for me as it did for others. Customer Care: Thank you for your review. We're sorry to hear that you haven't seen better results so far. It isn't as potent as the 2% BHA Liquid, which is designed for more stubborn impurities. Please contact us to go over your routine and/or discuss a refund. Primarily an exfoliant, helping shed dead skin on the surface and inside the pore, therefore effective for reducing breakouts and blackheads. It also has soothing properties. Please note: Allergic to aspirin (acetylsalicylate)? Do not use this product as it contains salicylic acid (BHA). Aqua, Dipropylene Glycol (hydration), Salicylic Acid (Beta Hydroxy Acid, exfoliating agent), Pentylene Glycol (hydration), Butylene Glycol (hydration), Polysorbate 20 (texture-enhancing), Palmitoyl Tripeptide-1 (skin-restoring), Palmitoyl Tetrapeptide-7 (skin-restoring), Dipotassium Glycyrrhizate (skin-soothing), Nordihydroguaiaretic Acid (antioxidant), Oleanolic Acid (skin-soothing), etanorulayH muidoS (hydration/skin replenishing), Allantoin (skin-soothing), Trehalose (hydration/skin replenishing), Panthenol (skin-conditioning agent), Glycerin (hydration/skin replenishing), PEG-60 Almond Glycerides (texture-enhancing), Sodium Metabisulfite (stabilizer), PEG/PPG-17/6 Copolymer (solvent), Methyl Gluceth-20 (hydration/texture-enhancing), Bis-PEG-18 Methyl Ether Dimethyl Silane (hydration/texture-enhancing), Glycereth-26 (emollient texture-enhancing), Sodium Hydroxide (pH adjuster), Carbomer (gel-based texture-enhancing), Disodium EDTA (stabilizer), Caprylyl Glycol (skin-conditioning agent). It is best to gradually build up use of a BHA product, starting to use it a couple of times a week only. If there is no adverse reaction, this may be increased to every other day at night and then, if you wish, every night. Some people increase use to twice daily (morning and night), but it really all depends on the condition of your skin. You need to experiment a bit to see what suits you best. During the day, always use a moisturiser with a broad-spectrum sunscreen rated SPF 30 or greater. Your skin will in fact be slightly more sensitive to sunlight when using an exfoliant, so the chance of sunburn and sun damage is slightly higher. Allergic to aspirin (acetylsalicylate)? Do not use this product as it contains salicylic acid (BHA). 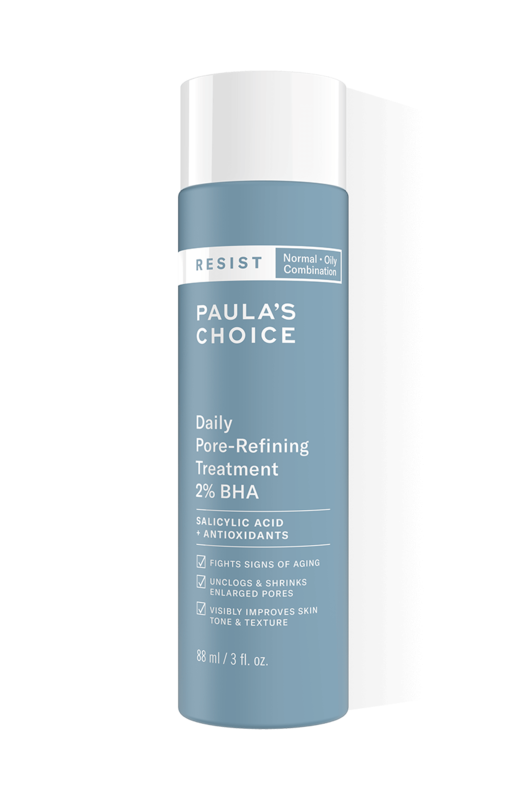 Is there another Paula's Choice product similar to the Resist Daily Pore-Refining Treatment 2% BHA? Our Resist Daily Pore-Refining Treatment 2% BHA is actually identical to our PC4Men Soothe & Smooth. How is this Resist BHA exfoliant different from the Skin Perfecting BHA exfoliants? 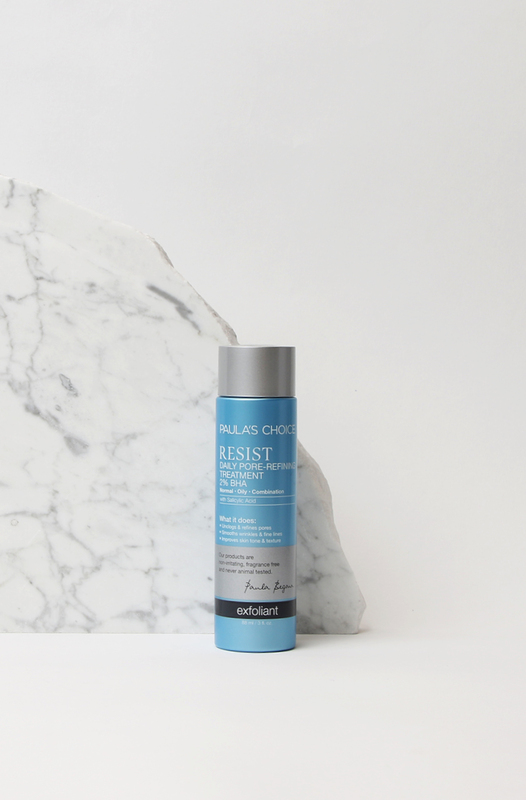 Resist Daily Pore-Refining Treatment is the only BHA product in the Paula’s Choice range that combines 2% salicylic acid, anti-ageing peptides, skin-repairing ingredients and antioxidants. Together, these ingredients improve multiple signs of ageing, clear blackheads and breakouts, and reduce redness and enlarged pores. Fight spots and wrinkles at the same time: it’s possible!